It adds up your steps. It calculates your calories burned. It tells you how much fuel you have, and not the gas-guzzling or calorie-consumption kind but a metric that puts a number on all the movements you do during the day from taking out the garbage and walking the dog, to sweating through P90X video or Zumba and preparing dinner. And if nothing else, The Nike+ FuelBand makes for a pretty sharp-looking watch (hey, those were Nike’s words not mine, and I can’t help but nod in agreement). When I first heard about the FuelBand, I thought it’d be the perfect exercise tool for my mom to use. She’s had pedometers and they’ve either overestimated her steps or met their demise falling into a toilet. She tried a Polar fitness watch, a variation of one that Liz got me hooked on, but got frustrated when the stick figure spent more time sitting than zooming across the screen (that’s probably more her fault than the machine’s but let’s just say it didn’t motivate her to exercise any more or less). And lately she’s just relied on the digital readouts on the elliptical, or the treadmill, or the stationary bike. And we all know how wrong those can be. I was convinced that the FuelBand would help track her activity, from running up and down the stairs to the gardening she claims exhausts her more than her treadmill walks. And that it would dispel the elliptical readouts claiming she burned at least 200 calories even though she was barely on the machine for 15 minutes and never broke a sweat. Turns out that I was the one who got addicted to the FuelBand—and I can’t give it up. Mom’s going to have to buy one of her own or wait until her birthday rolls around because this toy is staying wrapped around my wrist, except for when I’m swimming or showering (the FuelBand can stand up to sweat but it’s recommended that you don’t submerge it in water), until it dies. I love watching Fuelie dance across the screen when I reach a goal. I love that I can collect Fuel by folding clothes, raising my arms above my head (if I’m really lazy), or making dinner—even if it's minimal. I love hitting Fuel streaks, where I’ve hit or gone over my Fuel goal for the day. I could care less that Nike Fuel is a slightly made-up metric (that's my impression)--even months after first use I still can't completely figure out how its accelerometer calculates my Fuel from skiing, running and cycling. It gets me moving. It gets me to work out on days when I’ve been completely sedentary and encourages me to walk or ride to my destination instead of hopping in the car (though I learned that you can log fuel, not much, when you’re behind the wheel). If I haven’t hit my Fuel goal and it’s 11:30 at night, I’ll bust out a quick workout. True story: I was about 200 points shy of my goal after falling asleep on and off all day and never doing my bike workout after dinner like I promised myself. When I woke up after nap No. 5, I hopped on my bike (it was on the trainer) and pedaled until I saw the Goal lights flash on my band. Is that normal? Probably not. But if it means more activity in a device that's about as large, yet less flashy, than a LiveStrong band, I'm all in. 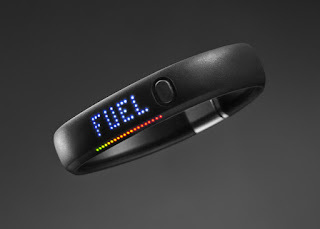 Have you tried the FuelBand? What did you think of it?